WASHINGTON (AP) — Beto O’Rourke opened his Democratic presidential campaign this past week with a call to action on global warming that misrepresented the science. From Iowa, he claimed scientists are united in believing the planet only has a dozen years to turn the tide on climate change, which is not quite their view. In Washington, an exasperated federal judge fact-checked the “no collusion mantra” recited by President Donald Trump and his associates as they try to dispel suspicions that people from his 2016 campaign and Russia worked together to tilt that election. Judge Amy Berman Jackson, while sentencing former campaign chairman Paul Manafort, reminded her courtroom — and indirectly the president — that Manafort’s trial was unrelated to questions of collusion with Russia. That didn’t stop the refrain. “Again that was proven today, no collusion,” Trump tweeted. O’ROURKE, on global warming: “This is our final chance. The scientists are absolutely unanimous on this. That we have no more than 12 years to take incredibly bold action on this crisis.” — remarks in Keokuk, Iowa, on Thursday. TRUMP, on Manafort’s sentencing to a second federal prison term: “I can only tell you one thing: Again that was proven today, no collusion.” — remarks Wednesday to reporters at the White House. THE FACTS: There was no such proof in that trial or in Manafort’s other trial. Whether collusion happened was not a subject of the charges against Manafort. It’s one of the central issues in a separate and continuing investigation by special counsel Robert Mueller. On Wednesday, Jackson sentenced Manafort for misleading the government about his foreign lobbying work and for encouraging witnesses to lie on his behalf. Again, the case did not turn on his leadership of Trump’s campaign. “The investigation is still ongoing,” she noted, scolding Manafort’s lawyers for bringing up the “no collusion” refrain during the trial. TRUMP: “Since 1976, presidents have declared 59 national emergencies. ... The only emergency Congress voted to revoke was the one to protect our own country. So, think of that: With all of the national emergencies, this was the one they don’t want to do. 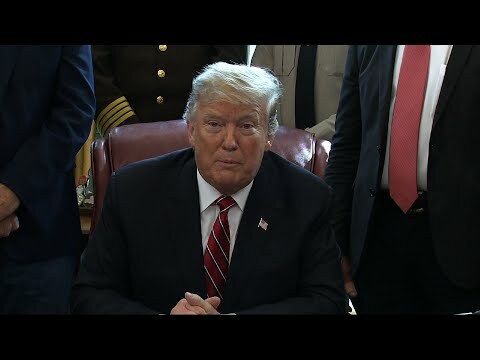 And this is the one, perhaps, they should most do.” — Oval Office remarks Friday after vetoing the congressional resolution seeking to strike down his declaration of a border emergency. TRANSPORTATION SECRETARY ELAINE CHAO, on positive train control: “Nothing happened on this until we came into office. And I would like some credit for that.” — remarks Monday to reporters. Data provided by the FRA shows that by the end of 2016, positive train control was in operation for 16 percent of freight railroads’ required route miles and 24 percent of passenger railroads’ required route miles. As of December 2018, it was operating for 83 percent of route miles for freight railroads and 30 percent of passenger railroads’ required route miles. TRUMP, on former FBI lawyer Lisa Page: “Comey testified (under oath) that it was a ‘unanimous’ decision on Crooked Hillary. Lisa Page transcripts show he LIED.” — tweet Wednesday. TRUMP, on how he stood at his Scottish golf resort, Turnberry, on the eve of the Brexit referendum and predicted that the British would vote to leave the European Union: “I predicted it was going to happen and I was right and people laughed when I predicted it and they won by about two points. And I was standing out on Turnberry and we had a press conference and people were screaming. That was the day before, if you remember. I think you were there. And people were screaming and I said, ‘No, I think it’s going to happen.’ And people were surprised I made the prediction ...because President Obama made the opposite prediction. And I was right.” — remarks Thursday at White House.